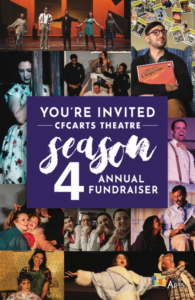 Announcement of our anticipated 4th Season! This event will be held at The Mezz. Valet parking is available for a small fee. There is limited street parking and a parking garage nearby. $250 – “Committed Patron” – Get one (1) Season Ticket for Season 4! $500 – “Super Patron” – Get two (2) Season Tickets for Season 4! $1,500 – “Show Producer” – Get your name listed as a Producer on Marketing Material for One Production in Season 4! $5,000 – “Season Sponsor” – Get your name listed as a Producer on ALL Marketing Materials for Season 4!